ABSTRACT: Deep-water agglutinated Foraminifera (DWAF) were recovered from Miocene to Pliocene sediments in 103 samples from IODP Hole M0002A on the Lomonosov Ridge. The First Occurrence of DWAF in Hole M0002A is observed just above the color change corresponding to the boundary between Lithological Subunits 1/4 and 1/5 in Core section –44X-1. 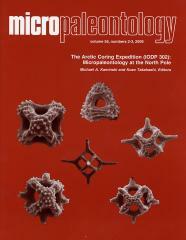 The foraminiferal record of Hole M0002A consists entirely of agglutinated benthic species, largely sparse assemblages containing Cyclammina pusilla and Alveolophragmium polarensis. The faunal succession in Hole M0002A is subdivided into three assemblages based on the stratigraphic ranges of characteristic taxa: (1) a relatively diverse assemblage at the base of Lithological Subunit 1/4 (Cores 44X-1 to –38X), with abundant agglutinated foraminifera including Reticulophragmium pusillum and Ammolagena clavata, indicating connections with the North Atlantic. This assemblage displays the best preservation, which is here attributed to higher concentrations of dissolved silica in pore waters (2) A less diverse assemblage characterized by Alveolophragmium polarensis with Adercotryma agterbergi, in the lower part of Lithological Subunit 1/3 (Cores –38X to –35X); (3) a sparse residual assemblage within Lithological Subunit 1/3 with Rhabdammina spp., A. polarensis and R. pusillum indicating poor preservation of organically-cemented DWAF in Cores –34X to–10X. A comparison of the DWAF assemblages from the Lomonosov Ridge with previously studied Miocene assemblages from ODP Hole 909C in the Fram Strait, Norwegian-Greenland Sea (Kaminski et al. 2005), suggests that the inflow of Atlantic intermediate water into the Arctic Ocean began prior to 17.5 Ma.